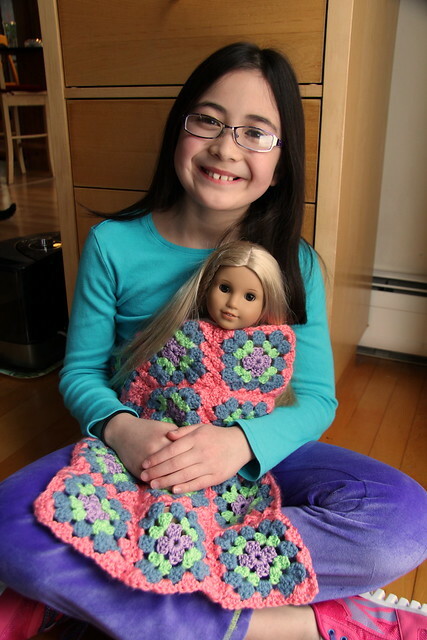 Who would think that having a daughter with an American Girl doll would inspire me to learn to crochet? I guess doing a smaller size blanket is the perfect learning project. I first saw this free crochet pattern from Liberty Jane Patterns. After watching numerous YouTube videos on crocheting granny squares, I finally got the hang of putting together these cute blankets. I used an H8 5mm crochet hook with medium weight yarn. Luckily I could also use a lot existing knitting yarn. In total there are 12 squares in this blanket in a 4x3 rectangle. 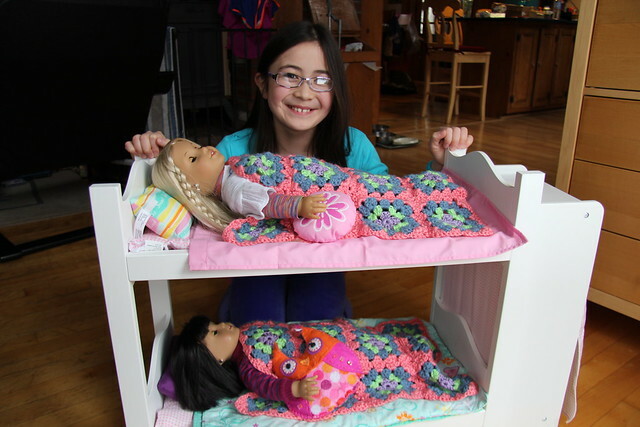 Of course both dolls needed their own blankets. This awesome bunk bed came for Christmas from Santa Target. It is really wonderful for the dolls! Ivy's American Girl Crafts Owls Sew and Stuff Kit was lovingly stitched by Dova herself.